The 111th Edition of the Carnival of Space is now online over at 21st Century Waves. Over the last few weeks, I have been presenting some of the mutual events in the Jupiter system, particularly solar eclipses on Io by either Ganymede or Callisto from the perspective of Io. 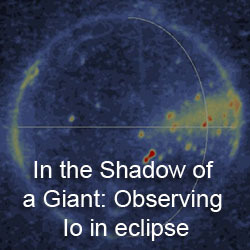 However, a pair of amateur astronomers, John Sussenbach and Marc Delcroix, captured numerous observations of the solar eclipse on Io by Ganymede on June 24. Delcroix even plotted the brightness of Io versus time as the eclipse progressed. John Sussenbach also took a look at one of the the solar eclipses by Callisto on June 20. 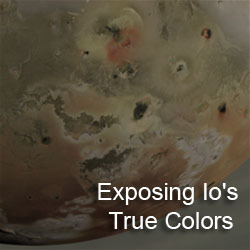 Plenty of important meetings related to the exploration of Io and the Jupiter system will be taking place this week. This includes a Europa/Jupiter System Mission Joint Science Definition Team (EJSM JSDT) meeting today, an Outer Planets Assessment Group (OPAG) meeting tomorrow, and the EJSM Instrument Workshop on Wednesday through Friday. I might be listening into the EJSM Instrument Workshop for at least some of the talks, but I haven't decided yet. Today's Astronomy Picture of the Day showing the volcano Arak Krakatoa erupting at night is pretty awesome. Definitely worth checking out. Van Kane has been keeping up with last week's Planetary Science Subcommittee and Decadal Survey Meetings. One of the key issues that seems to be coming to a head is the flat planetary science budget projected in the out years in the current budget proposal. 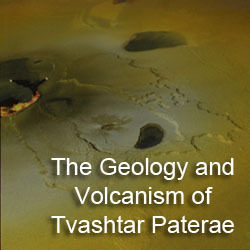 This would cause increasing budget pressure on many projects, not only because of the lack of budget increases (resulting from the poor government revenues) and from cost overruns on some projects, including the albatross of planetary science, the Curiosity rover (née Mars Science Laboratory). According to Kane, Ed Weiler at the PSS meeting stated that there is not enough money in the Planetary Science Division budget projections to fund the Europa/Jupiter System Mission. As Kane stated in his blog, this is definitely bad news. Celestia version 1.6 was officially released late last week. Celestia is definitely one of the space simulator, particularly thanks to its support for NAIF Spice kernel files for spacecraft and planetary body trajectories and orientations. The software also has built-in video and screenshot support, which I often take full advantage of for this blog.